Do you ever feel trapped by the effects of karma and wish you understood more about it? Have you ever wondered if it was possible to alter your karma? If you are looking for a deeper understanding of the different types of karma at work in your life and ways to create transformation then join me for this workshop on Understanding Karma and Karmic Meditations. 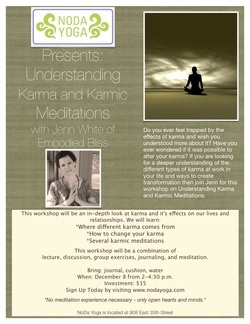 The workshop combines lecture, discussion, group exercises, journaling, and meditation.